Dickensian language is so hard to get through at some points in the passages and most scenes were merely dramatic and actionless. Still, I loved his writing and the memorable characters. It's really true that he can describe the surroundings in high detail and his wide range of vocabulary makes this story redeemable. Although the central focal point of the story is Oliver Twist, he is just a tool to sketch out the lives of all the people he encountered. He really doesn't do anything remarkably interesting except cry excessively and his meek actions are a bit unrealistic. Nevertheless, he suits as the best foil to all the other players in this story; it's so easy to compare him to the Artful Dodger and etc. I understand why this is a prime example for the school curriculum and the plot is simple enough to understand. However, this was originally released as a weekly serial issue so Dickens's intention was for OT to be purely leisure reading. The only other book I read by him is A Tale of Two Cities in sophomore year which was a bad timing since I didn't appreciate his extraneous sentences back then. 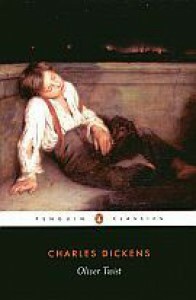 Since I read this outside of school, I can say that partially adds to my full immersion of the Dickens experience. If that even makes any sense.